We fix tilting, leaning chimneys! Call us for a free chimney foundation repair quote today! We serve Newark, Philadelphia, Reading, and many nearby areas in Pennsylvania, New Jersey, and Delaware. To repair a tilting chimney, we at Philadelphia Basement Systems recommend stabilizing it with a helical pier system. We Do Tilting Chimney Repair In Pennsylvania, New Jersey, and Delaware! At Philadelphia Basement Systems, we specialize in foundation repairs of all kinds -- including those related to tilting, leaning chimneys. Our warrantied solution will quickly and permanently solve your foundation issue. 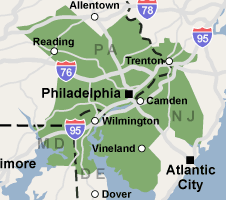 Our service area includes Philadelphia, Newark, Reading, and nearby areas such as Wilmington, Camden, Trenton, Bensalem, Vineland, Chester, Cherry Hill, in Pennsylvania, New Jersey, and Delaware. Call or e-mail us today to schedule your appointment!